99 Ranch Market is an Asian food supermarket chain owned by Tawa Supermarket Inc., which is based in Buena Park, California. 99 Ranch has 50 stores (as of November 2018), primarily in California, with other stores in Nevada, Oregon, Washington, New Jersey, Texas, and Maryland. The company also started offering shopping via its website in 2014. Founded in 1984 by Taiwanese immigrant Roger H. Chen, 99 Ranch Market has grown into the largest Asian supermarket chain in the United States. Roger Chen, a Taiwanese-born American, opened the chain's first location in 1984 in Little Saigon, a Vietnamese American community located in Westminster, California (now closed). In 1987, a second market was opened in Montebello (also now closed). It was originally called 99 Price Market but was eventually renamed 99 Ranch Market to give the supermarket a somewhat trendier name. The supermarket's name has led to some confusion throughout time. Most commonly, there is debate over the chain's name, with many referring to the supermarket as "Ranch 99." This may stem from the fact that many store locations' front signage is designed with the "99" logo between the words "Ranch" and "Market." The company, however, is and has always been officially branded as "99 Ranch." In addition, some of the stores (especially those in Southern California) are located in the same market area as the similarly named 99 Cents Only Stores, but nevertheless there is no relation between the two chains (99 Ranch Market specializes in Asian-American supermarket products while 99 Cents Only is a variety store that sells products at a price ending with 99 cents). Likewise, in Phoenix, Arizona, there is a similarly named ethnic supermarket called "Pro's Ranch Market", but instead of selling Asian products it sells completely different Mexican products. Prior to 1998, all stores that were opened outside of California were done through franchisees. Except for a single store in Nevada, all of these franchises had either failed (Hawaii and Georgia), become independent (Indonesia), or both (Arizona). In their first expansion outside of California, company owned stores were opened in the Seattle area at the Great Wall Shopping Center in 1998 and a second store at the Edmonds Shopping Center in 2003. Over the years, 99 Ranch Market has developed into the largest Asian supermarket chain, with its own production facilities, including farms and processing factories. The chain is currently headquartered in Buena Park, California. In addition to its American stores, it maintains its own production facilities in China and these company-owned plants have implemented quality control measures to ensure that products from China are compliant with Food and Drug Administration standards and regulations. A franchise store was established in Atlanta at the Asian Square in 1993. This store was unable to compete with more recently opened East Coast based chains like Super H Mart and closed in 2010. In 1993, the parent of the 99 Ranch Asian supermarket chain, Tawa Supermarkets, created a Chinese-Canadian supermarket chain called T & T Supermarket (大統華) as a joint venture with Uni-President Enterprises Corporation of Taiwan and a group of Canadian investors headed by President and CEO Cindy Lee. T&T initially started stores in the Vancouver area, and then expanded throughout Canada and into Edmonton, Calgary and Toronto. Tawa and partners sold the T&T Supermarket chain to Loblaw Companies in 2009 for $225 million. In 1995, the first 99 Ranch Market location in the state of Nevada was opened by a franchise that was owned by Chen's nephew Jason Chen as the anchor for the new Chinatown Plaza development in Las Vegas. A second Las Vegas area location was opened two decades later in October 2015. In Phoenix, a franchise store was established by E&E Supermarkets in 1997 at the Chinese Cultural Center. Unfortunately, this venture did not last long and E&E Supermarkets filed for bankruptcy in 1999 and the store was eventually closed. Another franchise store in Honolulu was established by Sunrise USA, Inc. in 1998 at the Moanalua Ethnic Village. This store was closed in 2007. In 1997, PT Supra Boga Lestari established a franchise in Jakarta, Indonesia. After the May 1998 riots, PT Supra Boga Lestari decided it was best to break its ties with Tawa and become independent while using the similarly sounding "Ranch Market" and "Ranch 99 Market" names in Indonesia. Expanding into Texas, two company owned stores were opened near Houston in 2008 and 2009 while at third store was opened in the Dallas–Fort Worth metroplex at Plano in 2010. A fourth Texas location opened up in Carrollton in March 2016 followed by a fifth location in Katy in August 2016. A sixth location in Austin, TX opened on March 3, 2018. The company's first store location east of the Mississippi River was open in Edison, New Jersey in January 2017 in a former Pathmark location. A second New Jersey location was opened in April 2017 in Jersey City. In August 2017, the company opened its first Oregon store in Beaverton. In April 2018, the company opened its first store in the state of Maryland, in Gaithersburg. Although most of its customers are ethnic Chinese Americans, shoppers also include recent immigrants from China, ethnic Chinese from Vietnam, and others. The chain sells a wide range of imported food products and merchandise from Hong Kong, Japan, China, Taiwan, Korea, and Southeast Asia (particularly Vietnam and Thailand). It also carries some domestic products made by Chinese American companies and a limited selection of mainstream American brands. In addition, it has also reached out to pan-Asian customers, especially Filipino Americans and Japanese Americans, by opening locations in areas predominantly populated by people of these two ethnicities. Because 99 Ranch Market serves a predominantly Chinese American base, Mandarin Chinese serves as the lingua franca of the supermarket and its adjacent businesses. In-store PA announcements announcing specials are multi-lingual and often spoken in English, Mandarin, Cantonese. The name of the chain includes "99," a number considered lucky by ethnic Chinese. The number nine in Chinese sounds like the word for "long-lasting." In earlier times, the company utilized an English slogan of "united at heart for a better future," with the Chinese slogan being "大華與您共創未來" (Dà Huá yǔ nín gòngchuàng wèilái - "99 Ranch is creating the future together with you"). As of 2017, the company has grown towards a new and singular English slogan of "Your Favorite Destination For Asian Food Since 1984." Generally, the chain locates its stores in newer suburban Mandarin-speaking immigrant communities, such as Milpitas, California, where the supermarket is strategically located near the technology industries of the Silicon Valley which employ many Asian immigrants, and Irvine, California, where wealthy Taiwanese Americans settled during the 1990s. Non-suburban locations tend to be located in multi-ethnic districts. For instance, the Van Nuys, California and Richmond, California stores are located in multi-cultural neighborhoods and are popular among African American, Mexican American, and white American customers, as well as Chinese-speaking customers. Older Cantonese Chinese neighborhoods in California have not been as welcoming to the chain. The 99 Ranch in Los Angeles' Chinatown operated in the Bamboo Plaza area for several years, but eventually the store was closed, perhaps due to its obscure location and lack of parking space, and perhaps due to competition from local small grocers, who have maintained their popularity among elderly Chinese American shoppers. Setting up in suburbia, 99 Ranch Market is often the only Asian American supermarket and shopping center for miles around. For instance, 99 Ranch Market is one of the very few Asian supermarkets operating in the San Fernando Valley. Given the market chain's premium locations, the costs of rent for tenants are generally high, but other Chinese businesses, such as Sam Woo Restaurants, Chinese traditional medicine shops, and gift stores, have been known to follow 99 Ranch Market to its new locations, with 99 Ranch market becoming the anchor tenant for the smaller stores and restaurants within developing Asian suburban shopping areas. For example, in Phoenix, Arizona, the state's first 99 Ranch Market opened as part of a larger "COFCO Center" that offers a number of Asian restaurants and shops for the city and surrounding areas. Since 2008, 99 Ranch Market has opened locations in Texas, in particular Houston (2008), Sugar Land (2009), Plano (2010), Carrollton (2016), Katy (2016), Austin (2018), and Frisco (expected in 2018). This is in response to the growing population of Asian-Americans in Texas in the 2000s. Most 99 Ranch Markets are company-owned. The only franchised locations remaining in the United States are those in Las Vegas. In design, 99 Ranch Market stores are similar to mainstream American supermarkets, with aisles that are wider and less cluttered than in most other Chinese markets. The supermarket accepts credit cards for totals above $5.00 whereas many markets in old Chinatowns do not. Also, a handful of 99 Ranch Market locations have an in-store branch of East West Bank, a major Chinese American bank. Most 99 Ranch Market locations have a full-service take-out deli serving a combination of Cantonese, Taiwanese, and Szechuan fare. Some of the delis in the markets also feature pre-cooked meats, such as Cantonese roast duck (huo ya) and barbecued pork (Char siu). These stores also have a bakery with cakes and fresh Chinese pastries, most of the bread products and pastries sold in the markets are made inside the store. The 99 Ranch locations that do not have delicatessens and/or bakeries simply operate as bare-bones markets. 99 Ranch Market used to operate a membership VIP card program and send out direct mail circulars with coupons. All of these programs and promotions were discontinued in August, 2007, in favor of offering all customers the same price benefits. Although the chain remains successful and popular, prices are on average generally higher when compared to smaller non-chain Chinese groceries. In 2014, 99 Ranch Market re-launched a new point rewards program known as the Super Rewards Card, where customers gain 1 point for every pre-tax dollar spent. The chain also regularly runs sweepstakes giveaways, having worked with automakers such as Lexus, BMW, and Toyota. The chain also runs major advertising campaigns, including in-print ads in Chinese-language newspapers such as World Journal and radio ads on Chinese-language radio in Southern California. ^ Lanyon, Charley (2019-03-11). "The story of 99 Ranch Market, largest Asian supermarket chain in US". South China Morning Post. Retrieved 2019-03-11. ^ a b Pellissier, Hank (May 21, 2011). "99 Ranch Market". The New York Times. Retrieved June 26, 2011. ^ Hamilton, Denise (April 27, 1997). "99 and Counting: Roger Chen's chain of Ranch Markets is growing by leaps and bounds, thanks to his cross-cultural strategy of offering traditional Asian foods in a Western-style setting". Los Angeles Times. ^ Ganga, Maria (December 11, 1988). "Asian Lure for Anglos Growing Tawa Supermarket Chain Blueprints Expansion Beyond Its Ethnic Roots and Neighborhoods". Los Angeles Times. p. AM7. (Subscription required (help)). Alternate Link via ProQuest. ^ Hahnefeld, Laura (June 3, 2013). "Pro's Ranch Markets Files for Chapter 11". Phoenix New Times. ^ Brown, Brandon (May 31, 2013). "Pro's Ranch Markets files for Chapter 11 bankruptcy". Arizona Republic. ^ Kim, Nancy (September 14, 1997). "'Pan-Asian' mall planned in Kent; California developer to combine stores, restaurants in huge shopping center". Puget Sound Business Journal. ^ Tice, Carol (November 3, 2002). "More local Kmart closures? Nine Washington stores on list of potential sites". Puget Sound Business Journal. ^ Zhao, Jianli (2002). Strangers in the City: The Atlanta Chinese, Their Community, and Stories of Their Lives. Psychology Press. p. 84. ISBN 9780815338031. ^ Fay, Tim (December 2, 1993). "2 centers to debut for Asian Americans". Atlanta Journal-Constitution. p. A13. Alternate Link via NewsBank. ^ Keng, Natalie (May 2011). "Eat, Shop & Explore: Asian supermarkets offer fresh, colorful delicious food". Atlanta INtown. 17 (5). p. 32. Alternate Link via Issuu. ^ Wong, Jan (January 15, 2005). "Bok choy meets Main Street". The Globe and Mail. ^ "Loblaw buying T&T Asian food chain". CBC News. July 24, 2009. ^ "T&T Supermarkets sold to Loblaws Inc. for $225 million; Cindy Lee was a self-described housewife in 1993 when she opened her first Asian grocery store in Richmond". Vancouver Sun. July 25, 2009. Archived from the original on November 11, 2014. ^ Chung, Sue Fawn (2011). The Chinese in Nevada. Arcadia Publishing. ISBN 9780738574943 – via Google Books. Although several locations have served as Las Vegas's Chinatown since 1905, it was not until 1995 when Taiwan-born James Chen opened Chinatown Plaza, anchored by 99 Ranch Market, on Spring Mountain Road. With a pan-Asian flavor, Chinatown has become permanent and flourishing. ^ Newman, Barry (April 28, 2004). "Cultural Oases: For Asians in U.S., Mini-Chinatowns Sprout in Suburbia; Mr. Chen's Las Vegas Mall Feeds a Growing Hunger; Comfort Zones in Heartland; Ms. Wu Eyes the Pork Snouts". Wall Street Journal (Eastern ed.). p. A.1. (Subscription required (help)). Mr. Chen learned that early on. His Las Vegas Chinatown Plaza opened for business in 1995... But first, he went after the one anchor tenant that he knew would make a desert Chinatown work: 99 Ranch -- America's biggest Asian supermarket chain with 26 west-coast stores and franchises in Phoenix and Atlanta. The number 99 is lucky to Chinese, and "ranch" sounded trendy to another Chen from Taiwan -- Roger Chen -- who founded the chain in 1984. Alternate Link via ProQuest. ^ a b Shubinski, Jennifer (February 16, 2004). "Small grocers work to tap niche markets". Las Vegas Sun. ^ "99 Ranch Market opens doors to new Las Vegas store". Asian Journal. October 15, 2015. ^ Netherton, Martha (December 14, 1997). "In Sites: CBT wants Valley customer service center; Chinese grocery opens". Phoenix Business Journal. ^ Gabriel, Angela (October 29, 1999). "99 Ranch Market stays open after new management steps in". The Business Journal. 19 (55). p. 5. ^ "Mapunapuna shopping mall grows". Pacific Business News. March 15, 1998. ^ Daysog, Rick (December 23, 2006). "99 Ranch Market to close next year". Honolulu Advertiser. ^ Wu, Nina (February 23, 2007). "Palama market in talks over 99 Ranch lease; The Korean supermarket operator may take the space, but not the name". Honolulu Star-Bulletin. ^ "Ranch Market downsizes IPO to at least US$14 million". Jakarta Post. May 15, 2012. Archived from the original on 2012-05-16. Ranch Market Indonesia has had its own flag since 1998 after riots driving the American firm to leave the country. ^ "Our Story". Ranch 99 Market Indonesia. Archived from the original on 2013-12-31. ^ "Welcome to our blog!". Ranch 99 Market Indonesia. Archived from the original on 2013-10-21. ^ Trisnadi, Ade Irwan (June 23, 2010). "Profile: Nugroho Setiadharma: Developing a premium supermarket". Jakarta Post. Archived from the original on 2010-12-29. (Subscription required (help)). ^ a b Dawson, Jennifer (October 12, 2008). "99 Ranch Market hitches Asian post to Houston with first store in Texas". Houston Business Journal. ^ a b Walsh, Robb (November 9, 2009). "99 Ranch Market Grand Opening". Houston Press. ^ a b Pierce, Kim (July 18, 2010). "Coming to Plano: So-Cal Asian supermarket". Dallas Morning News. Archived from the original on 2015-02-06. ^ Brock, Katherine Cromer (July 19, 2009). "Redevelopment attracts 99 Ranch Market". Dallas Business Journal. ^ a b "Grand Opening! 99 Ranch Market -Carrollton". Fruitealicious - Bubble Tea Blog. March 24, 2016. Archived from the original on 2016-07-20. ^ a b "99 Ranch Market Grand Opening in Katy". Katy Magazine. August 10, 2016. ^ "Asian Grocery Chain 99 Ranch Market Opens Austin Location in March". Eater Austin. Retrieved 2018-03-21. ^ Cloud, Kristen (February 1, 2017). "99 Ranch Makes East Coast Debut In Former New Jersey Pathmark". The Shelby Report. ^ "99 Ranch Hosts Grand Opening Today With Special Discounts And Giveaways". Jersey Digs. April 21, 2017. ^ "99 Ranch Market Celebrates its First Store Opening in Oregon State" (Press release). 99 Ranch Market. August 24, 2017. ^ Rowles, Laura (May 2, 2018). "99 Ranch Market Opens First Store in Maryland". Montgomery Community Media. ^ "Slogan used in 2011". 99 Ranch Market. Archived from the original on July 7, 2011. Retrieved June 26, 2011. ^ "COFCO Center retail guide". COFCO. ^ "No Chinatown? No Problem! Part V: Phoenix". The Daily Meal. December 1, 2014. 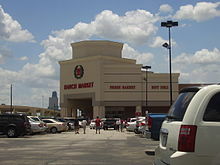 ^ Nadia Chaudhury, "Asian Grocery Chain 99 Ranch Market Opens Austin Location in March", Eater, February 14, 2008. Retrieved May 22, 2018. ^ Halkias, Maria (September 12, 2016). "Asian population growth brings new specialty retail center to Frisco". Dallas Morning News. ^ Kristof, Kathy M. (September 3, 2001). "East West Bancorp to Partner With 99 Ranch Market; Banks: First supermarket branches are expected to open early next year". Los Angeles Times. 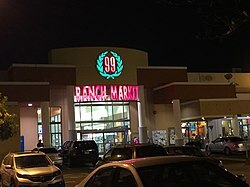 Wikimedia Commons has media related to 99 Ranch Market.